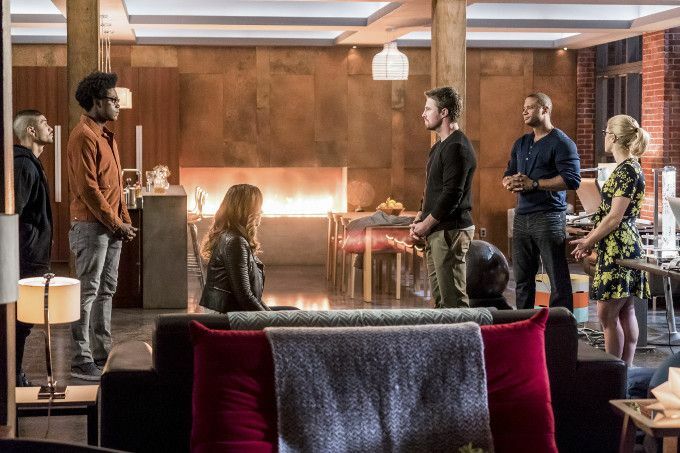 Team Arrow has been broken in two, but Oliver remains convinced that he can tackle Cayden James with only Diggle and Feliicty backing him up. Still, he does concede he could use some help, turning to a most surprising ally as he discovers one of Cayden's secrets. Meanwhile, as Wild Dog, Mister Terrific and Black Canary decide to start their own team to save Star City independent of Green Arrow, Dinah tries to reacquaint herself with her old partner, Vincent "Vigilante" Sobel, not knowing that he's part of Cayden James' new team! Dinah does have a point - why doesn't Rene lock his apartment door, apart from the reason that nobody on TV ever locking their outside doors? Cayden James refers to it being evening, yet daylight is clearly visible streaming in through the windows and doors of the warehouse where he confronts Jerry Bertinelli. Thea's 180 on the possibility of Black Siren being redeemed comes out of nowhere, suggesting a scene was cut for time in this episode. I've missed the scenes of Willa Holland and Paul Blackthorne playing opposite each other and the scenes here where we see Quentin torturing himself with thoughts of trying to save Black Siren while Thea reminds him to think of the other daughter he still has (i.e. Sara) while affirming that she's come to view Quentin as a second father is the emotional high-point of the episode. There's some fantastic lighting in the ARGUS scenes. The sequence of Green Arrow taking on Ricardo Diaz and his men is a fantastic blend of stunt-work and camera-work. In the episode's opening scene, we see Black Siren incapacitate Jerry Bertinelli with a "blown kiss"- a small shockwave that barely makes any noise which knocks him down and only stuns him. In the classic comics, Black Canary had such fine control of her powers that she could pulverize an ivory billiard ball without disturbing the hand that held it. This is the most control we've seen from Black Siren in the series to date. Oliver goes to investigate a security system failure at 74th and Jansen. This may be a nod to Master Jansen - the Buddhist monk and martial arts instructor whose Ashram Oliver Queen briefly stayed at on two occasions in the comics. Jerry Bertinelli asks Green Arrow if he ever thought of getting a big signal in the sky that people could use to call him. This is a nod to The Bat-Signal, which is famously used in the Batman comics for Commissioner Gordon to call Batman if he needs his help. While it is less famous than The Bat-Signal, the Star City police in the comics did use an Arrow-Signal to call for Green Arrow on several occasions. It was also referred to as "The Arrow Flare". The license plates in whatever state Star City is located are stamped with the motto "Land of Mist". This could be a clever nod to Washington State, which is famous for its humid weather. The Land of Mist is also the name of a science-fiction/fantasy novel by Sir Arthur Conan Doyle, featuring his scientist hero, Professor Challenger. Felicity makes reference to a Star City neighborhood called Adams Heights. This is likely a nod to Neal Adams - the artist who designed Green Arrow's Bronze Age "Robin Hood" style costume and illustrated most of the famous Green Lantern/Green Arrow comic that redefined Green Arrow as a modern day Robin Hood. The unnamed associate of Cayden James' from 609 played by actor Tobias Jelinek is identified by the name Mr. Sheck. He is still identified on the IMDB page for the series as "Boots". Curtis inserts the latest chip to correct John's nerve damage under the radial carpal. Some kind of electromagnetic frequency interference from Cayden James' bug in The Arrowcave creates an echo that Felicity, John and Curtis notice, leading to its discovery. Oliver makes use of a new trick arrow - The Garrote Arrow - to disable Black Siren. In actually, The Garrote Arrow is two arrows connected by a high-tension line. Shot simultaneously and anchored to a point, the wire between the arrows "locks" constraining whatever is between the two arrows... like the neck of a woman with a sonic scream. Oliver also makes use of some kind of electric arrow to disable one of Cayden James' T-spheres. This causes a chain reaction that disables the other two T-spheres James has made. Felicity reworks the T-spheres so they can be controlled remotely from a laptop. This enables John to help Oliver in the fight against Ricardo Diaz, by deploying the T-spheres as a flying taser. Dinah: You know, anybody in this office could arrest you. Hell, I could arrest you. Vince: For what? I'm a Central City Police Officer. The only rap on me is that I am presumed dead. (pauses) Then again, I was, an undercover, so that death is probably bogus. Dinah: The Vigilante put the fear of God into these guys. Vince: At least The Vigilante isn't killing them. Dinah: (smirking) Most guys just send flowers. Green Arrow: Do you really think that I'm going to help you win a turf war? Jerry Bertinelli: Well, I think you're the enemy of my enemy. Which makes us allies. John: So we're getting in bed with The Betinellis, now? Felicity: I remember the last time you got in bed with one of the Bertinellis. It did not work out well. Felicity: I have a long memory for these sort of things. Call me crazy. Cayden James: You've taught yourself some new tricks. Green Arrow: No more games. (To Felicity) Overwatch, I have the target. John: (looking at Felicity's monitor) That's a whole lot of bad news. Felicity: Arrow, you're about to get some company! Green Arrow: Overwatch, do you copy? Cayden James: I'm afraid Miss Smoak can't hear you. You see, I also have some tricks, Mr. Queen. And I have friends. Anatoly: Hello Kapiushon. How were your holidays? Diaz: Funny you should mention that. Diaz: Looks like we're getting a late Christmas present. Green Arrow: I thought you only targeted criminals? Vigilante: I thought you'd know vigilantes are criminals, Mr. Mayor. Cayden James: You'll find that I don't play games, Mr. Queen. But I do win. Black Siren: Enough! I am so sick of everyone not killing him when they have the chance! Thea: Look, I mean, everyone - even Ra's Al Gul - had moments of kindness. Quentin: I just can't stop thinking that if I abandon her, if I write her off as some kind of psycho... I dunno, it... It sounds crazy but if there is just some way to get through to her and I don't take it... it's gonna be like watching her die all over again. Thea: You're like a father to me, you know that? Thea: If you go down this road, Quentin, you could end up getting killed. Even if you don't care what happens to you, don't forget that you've got your other daughter. John: Send in the cavalry! Felicity: So... how does this compare to Halo? Jerry Bertinelli: All right! All right! Just take the freaking port! Cayden James: Thank you. Although you elected to betray me this evening, you ultimately made the right choice. Cayden James: Which is why I won't have your daughter killed. The episode opens in the office of Jerry Bertinelli - current head of the Bertinelli crime family. He was the nephew of Frank Bertinelli and cousin of Helena and Pino Bertinelli. He is the only member of the crime family who is not in jail or dead. Jerry decides to name his new ship "The Huntress" after his cousin. This is a reference to Helena Bertinelli, who was last seen on the show in 217. Helena did appear in the Arrow: Season 2.5, where she made her peace with Oliver Queen and it was suggested that she was going to be recruited to Amanda Waller's Suicide Squad. Jerry Bertinelli has a daughter attending Columbia University. As this episode starts, Felicity has just pulled 21 consecutive all-nighters trying to find Cayden James and Black Siren. The latest microchip Curtis and Felicity developed to treat John's nerve damage costs 2.24 million dollars. This is their second attempt at fixing John electronically. Quentin has fired Rene as his assistant. Quentin rehires Thea as Chief of Staff for the Mayor's office. John plays Halo. Felicity says she always imagined him as a Call of Duty fan. Vigilante scared five wanted criminals into turning themselves in. Oliver refers to the prototype T-sphere that was stolen from The Bunker by Black Siren in 601. Felicity discovers the bug that was planted in The Bunker in 601. According to Jerry Bertinelli, Huntress is "underground". This suggests that Helena got out of prison sometime since her last official appearance in 217. Jerry Bertinelli asks Green Arrow to help him fight Cayden James' takeover of his docks. Felicity refers to the events of 107 & 108 and Oliver's relationship with Helena Bertinelli. The license plates in whatever state Star City is located are stamped with the motto "Land of Mist". The Star City Zoo has a new reptile house with a Komodo dragon. Rene has not told Zoe that he's lost his job. The case against Oliver Queen being Green Arrow has been moved from the FBI to the Star City DA'ss office. Curtis agrees to hack the DA's office files to delete any evidence they have that Rene is Wild Dog. Dinah stopped being Black Canary several weeks earlier. Thea says that she isn't ready to return as Speedy yet, but she intends to help Oliver as soon as she can. The unnamed associate of Cayden James' from 609 played by actor Tobias Jelinek is identified by the name Mr. Sheck. He is still identified on the IMDB page as "Boots". Oliver points out that Cayden James has known their identities for months yet done nothing with that knowledge and that they have no idea what his plans are. The Red Lions are a Chechnyan death squad. Felicity's mother made her watch the movie Bull Durham over and over. Despite this, Felicity agrees it is the best baseball movie ever made. Curtis, Dinah and Rene reject Oliver's attempt at reconciliation and move forward with their plans to make their own team of heroes. Curtis gives John the third version of his reworked chip. It works, giving John full mobility with his arms again. Thea gives Quentin copies of several pictures she had of Laurel for his photo album. Thea offers to help Quentin with his plan to try and redeem Black Siren, though neither of them have any idea how they're going to do it. Curtis builds a new lair for himself, Rene and Dinah into the old Helix hideout. Cayden James is now aware that Dinah is aware of the link between Vigilante and himself. Dinah refers to a nightmare stakeout that she once endured in Central City in a car with a broken heater in freezing weather. Dinah's confronting Vigilante without police back-up seems incredibly short-sighted on her part, to say nothing of being a violation of standard police protocol. As she points out later, this also outs the fact that Team Arrow is onto Cayden James's bug to the bad guys. Averted in the case of Black Siren, who shows far greater control of her powers in the opening scene than she ever showed before. The only way for the current chain of events in the series to work is for all of the heroes to hold petty grudges and forget about the power of working together, as the villains - all of whom have wildly different goals and methodologies - put aside their differences for a common goal. This is especially nonsensical in the case of Vigilante, a killer of criminals who is now working with Russian gangsters, drug dealers, a psychotic metahuman and a criminal mastermind hacker... for reasons. Overall, Season Six is fast on the way to beating out Season Four as the worst season of the series and I'm starting to think cancellation might not be a bad thing.